Dan and I went to Ottawa, Canada's capital, over the thanksgiving weekend. It was a much-needed break and we were so happy to get away as we hadn't been on vacation yet this year. We had wanted to go to Ottawa for a while and we had heard that the fall colours there are absolutely beautiful...THEY ARE! I (yes me) put together a list of the things to do there, along with some restaurants and breakfast places. Dan and I LOVE BBQ food. We drool whenever we watch Diners, Drive-Ins, and Dives, and they are at a smokehouse in the Southern States. We saw Fatboys Southern Smokehouse on Tripadvisor and decided to go there for dinner. I really liked the atmosphere of the restaurant. I actually felt like I was somewhere in the Southern US. We ordered a sharing platter that came with; pulled pork, brisket, bbq chicken & ribs. We also got a side of mac & cheese, greens, and cornbread. The food was delicious and I left with a food-baby that made me look at least 7 months along. One of the most beautiful things about Ottawa in the fall is the colour of the leaves! They are so beautiful. We headed to Major's Hill Park for a walk and I was in my element as there were LOADS of maple trees. I made a joke to Dan before we came here about being in Canada for a year & a half and still not seeing a maple leaf...but it was true! We don't seem to have any maple trees in Calgary, at least I haven't seen any! I couldn't believe the size of some of the leaves so of course, I had to hold it in front of my face. After Major's Hill Park, we walked down to Parliament Hill. It was beautiful and reminded me of London's parliament. There is a lot about Ottawa that reminds me of the UK. We didn't have a chance to do a tour because the queues were really long...I guess that's what happens when tickets are free! One of the really cool things about Ottawa is that Quebec is just over the border, it isn't far at all. We drove over to Gatineau Park which is known for being beautiful in Autumn and it was! The colours were like nothing I had ever seen before. Back in Scotland, the leaves turn brown and then go to mush. These leaves were all different shades of red and orange. We had a really great time in Ottawa and would definitely return! 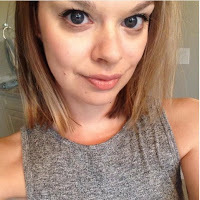 Have you been to Ottawa? What is your favourite thing about there? I recently went along to the new PopBar location at CrossIron Mills. This is the first location in Calgary and the second in Alberta. With locations all across the USA, Japan, Indonesia and South Korea, hopefully, there are much more Canadian locations to come! 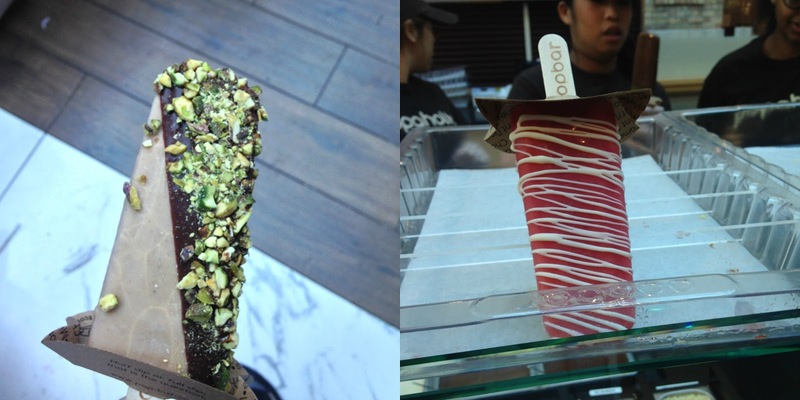 Popbar is an awesome gelato stand that you may see popping up in malls near you. They proudly source only natural ingredients for their bars and the products are freshly made in the PopLab right on location! Another great thing? The products are gluten free and kosher certified. All of the bars contain no artificial colouring and are preservative free. So, Popbar is not like going to a regular gelato place, it is so much more. They have a wide variety of flavours that rotate. The basic flavours for the gelato are; banana, chocolate, coconut, coffee, hazelnut, mint, peanut butter, pistachio and vanilla. For the sorbetto, the flavours are; lemon, mango, mixed berry, orange, peach, pineapple and strawberry. For Autumn, they even have a pumpkin pie flavour! You can see the full range of flavours here. You can also customise your PopBar with toppings, which is there is also a large selection of. Some of the toppings and dips available are; almonds, hazelnut, pistachio, caramel corn, dark chocolate and white chocolate. I couldn't go to PopBar and just try one item...so I had two. I started off with the hazelnut gelato, half dipped in dark chocolate with pistachio topping. Biting into the hazelnut gelato with the dark chocolate was like eating Nutella. It was rich, creamy and delicious. The pistachio was a great finishing touch and I enjoyed the extra crunch. After trying a gelato, I had a sorbetto. I went with the blood-orange, drizzled with white chocolate. Wow. The flavours were amazing. It was so fresh and zingy. Perfect for a summer's day. The blood-orange was my favourite out of the two. It felt hydrating and was so simple yet delicious. Have you tried PopBar yet?